Mary: You in Danger, Gurl. Hamburger Mary’s opens to some controversy. But to our guest reviewer, it’s mostly just a mush of mediocrity, with weak drinks. In spite of its name, the vision of gay culture that Hamburger Mary’s presents is closer to green-bean casserole. From the lazy assortment of cultural signifiers, I honestly thought straight haters from Muncie were making fun of gay culture when I walked in the door with a group of friends in drag one Saturday evening, and giving SF Weekly’s main restaurant reviewer a few days off to do some asparagus cleanse. Big thanks to Peter Lawrence Kane for letting me sit in this week (but we can all agree that egomaniac has enough bylines). But Hamburger Mary’s not a very good restaurant, serving mushy meat, soggy fries, and painfully weak drinks. The word “community” is almost completely meaningless at this point. But Hamburger Mary’s commitment to community is built on a foundation as shallow as, well, foundation. 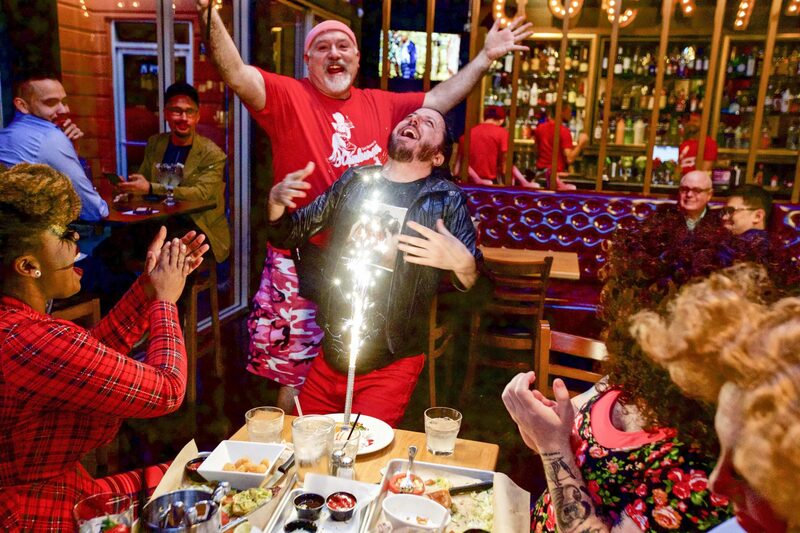 A drag restaurant is no longer as revolutionary as when the original Hamburger Mary’s opened in 1972 on Folsom Street in what is now The Willows — especially when it’s standard lip-synching routines set to pop numbers, free of any avant-garde weirdness. As with the scourge of V.C.-funded scooters, the problem with this restaurant actually consists of several concurrent issues, some of which are peculiar to the Castro. The first is a landlord who falls somewhere between capricious and vindictive. Virtually everyone in the neighborhood mutters about the notorious Les Natali, and although comparatively few neighbors will criticize his quirky actions on the record, he’s kept this address in a state of near-total disuse for almost 20 years. Natali owns or is otherwise involved in other Castro spots like Badlands and Toad Hall. The latter replaced The Pendulum, the city’s only bar catering to a gay African-American clientele, after Natali closed it for what appeared to be racially motivated reasons. (Feelings remain raw. As recently as Martin Luther King Day 2015, it was the site of a queer- and trans-specific Black Lives Matter direct action.) And Zapata Mexican Grill on the corner of 18th and Collingwood streets had a sword of Damocles hang over it for years, as Natali forced a series of short-term leases on the 21-year-old business, which finally called it quits. After seven months, that space, too, remains vacant. If we toted up the number of businesses in San Francisco with shady landlords, there’d be almost nowhere left to eat. It’s an altogether different phenomenon than a chef-owner who commits acts of sexual misconduct against his staff. But it’s hard to judge something like Hamburger Mary’s — which in spite of its roots in early-1970s SoMa feels like as much of a chain as Applebee’s — as being community-focused when the impression it gives off is one of parading dated, predictable tropes of gayness around for tourists. The decor scrapes bottom, and it’s not a bossy bottom. There are a lot of people who died tragically in there — Elvis, Marilyn, Michael Jackson — plus framed shots of Cher, Ellen, Diana Ross, and Joan Crawford, a few vintage beefcake pics, a cardboard-cutout Liberace, and one strange photo of circa-1980s Joan Rivers pretending to lick a batter-covered spoon. Isn’t one positive stereotype about LGBT people that we have wild imaginations? You wouldn’t know it from stepping in here. Even ignoring that, Hamburger Mary’s real sin is the drinks, which are as spiritless as if we lived in one of the Queen’s realms — the real queen, I mean — that mandate those upside-down metering contraptions that pour off tiny units of booze. My body is not so much a temple as a defunct mall where the anchor tenants were Mervyn’s and Caldor, so when I’m paying $9 for a cocktail that specifically claims to be “big & strong,” I demand more than a tumbler full of ice and low-end fruit juice. The Fruit Punch tastes like exactly that — which would almost be fine, but this is 2018 and if you don’t care about mixology and tasting notes and all that, at least deliver intoxication or else I’m simply going to have to ask to speak to the manager. The cheapness isn’t all. The majority of the drinks are “Marytinis,” which means they use vodka as the base, a lowest-common-denominator gesture from gay bars during the late Clinton administration. Non-vodka cocktails are still rather dubious. A Dark and Stormy suffered from flat ginger ale, while an $11 Total Top Margarita tastes like spiked mixer. You can also order a $22 Long Island that comes in a novelty fishnet-clad leg — sort of like the “fruh-JEE-lay” lamp in A Christmas Story. You’ll definitely get a buzz there, although seeing all those L’eggs on the bar looks like the scene in The Wall with the fascist hammers. The burgers are OK, although the Tex-Mex no-bean chili on the Black & Bleu Boy definitely had beans in it. One refreshing sign of the times is that you can order a plant-based Beyond Burger in lieu of putting some beef between your buns. The skylit back patio has a lot of potential for when the brunch menu rolls around — one’s tolerance for drag shows goes up when one is hung over, does it not? — but otherwise, the menu is small. Other than the burgers, there’s only chili, a couple salads, and game-day apps like nachos and cheese fries. I will say this, though: The fried pickles ($12.50 for eight) were very good! In the context of the vacancy-plagued Castro, waiting almost two decades for something only to see so little thought go into it means Hamburger Mary’s might suffer the worst possible fate: becoming cool to hate. Mary, you in danger, gurl.